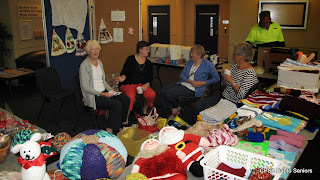 Thanks to all the staff at the Ribbonwood Centre for making the garage sale such a success. Let's hope next year is even bigger. As always our members pulled together to help and man the stalls. They arrived at 7am to set up and at midday to dismantle the stall. The time just seemed to fly as interested members of the public surged in and out of the event. Some of our volunteers took the time to try the aromatic sausage sandwiches from the Lions Club BBQ, just outside the centre's door. Let's face it who could resist? 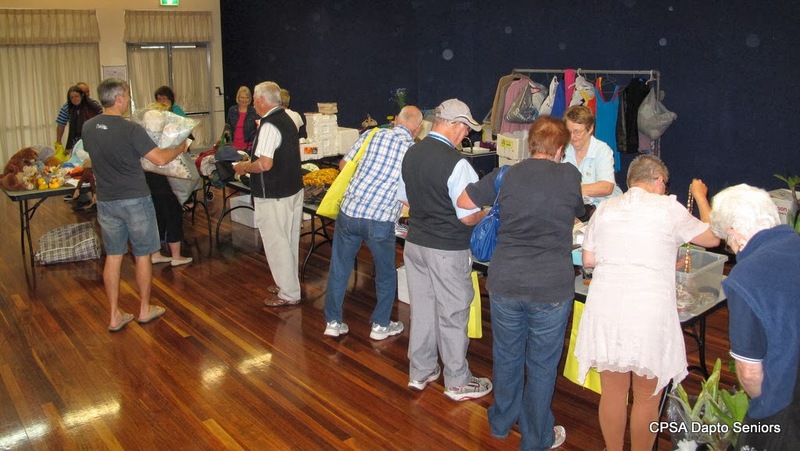 This was the scene in the Kurrajong Hall where Corrie, Val and Maureen set up our trade table. Thanks to all the members who donated items for us to sell. The craft group also took part selling some the lovely goods they had made during the year. Their stall in the Ribbonwood Centre foyer was strikingly colourful for visitors as they arrived. We hope the other groups that took part were as satisfied as we were with the response. Members of the public were offered our brochure as they arrived so... who knows? we might get some new members.